RICHMOND — The Indiana University East women’s track and field program could always count on an early-meet bounce from the high jump area over the past two seasons. The Red Wolves’ high jump triumvirate of junior Mackenzie Boles and sophomores Trisha Spivey and Autumn Kann spent the last two seasons re-writing the high jump section of the program record book, accounting for multiple individual victories, and accumulating scores of points toward the IU East team totals. 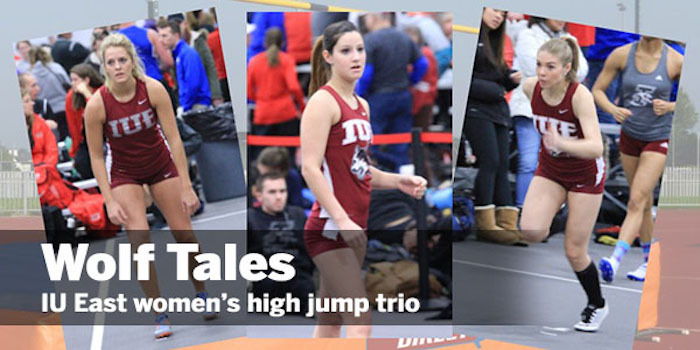 Boles is set to graduate at the end of this school year, so “The Trio” will make one of its final ensemble appearances this weekend at the River States Conference meet at the Robert Morris University Island Sports Center. The high jump competition typically takes place at the start of a track and field meet. The Red Wolves have come to expect good news from the high jump area – maybe a first-place finish, maybe a school record, maybe multiple point producers – to set the tone for the team’s day. Spivey made a splash with an indoor school-record leap of 1.63 meters – good enough to meet the qualifying standard for the NAIA national meet – in her very first college competition. She also set the IU East outdoor high jump record of 1.58 meters later in her freshman year. She won the high jump competition at three consecutive meets in the early months of 2016. She has won the conference Field Athlete of the Week award seven times in her two seasons, and was an all-conference honoree in 2016. Kann has multiple top-two finishes over her two college seasons. She was the top college finisher at the Taylor University Trojan Invitational in February. In addition to excelling at the high jump, Boles also holds the indoor school record for the long jump and has been a part of two school-record relay teams. She will complete her Bachelor of Science in Human Life Science with a minor in Chemistry in a few days. She has appeared on the Chancellor’s List (4.0 GPA) after each of her semesters at IU East. All three members of “The Trio” earned academic all-conference honors last spring. Only one person performs at a time in the high jump area, but all three members of “the trio” say it takes a group effort to clear the bar. Spivey has competed in the high jump since middle school, when she could clear heights that would place at many collegiate meets. She qualified for the Indiana state meet in the high jump as a senior at Union County High School, a short drive south of IU East on U.S. 27. Kann also tried the high jump for the first time in middle school. She claims she was “awful” at first, but she developed into a regional qualifier in the high jump at Triton High School in northern Indiana. Boles, who was a regional qualifier in the high jump at Lapel (Ind.) High School, joined the IU East track and field team during her sophomore year. A high jump attempt flies by in about five seconds, so the most memorable experiences for “The Trio” aren’t necessarily the jumps themselves. The best times often occur during practices, bus rides, and post-meet meals.